It’s that time of year again. Kids are heading back to school and Parkville Days are upon us. Starting this Friday, August 18, 2017, the festivities will begin and last through the entire weekend. 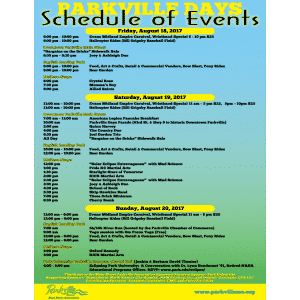 The Carnival and helicopter rides are featured Friday evening and the Parkville Days Parade early Saturday morning. Catherine’s Dance Studio looks forward to this fun event every single year. There’s just something magical about a small town parade. The Parkville Days Parade can be a bit hectic with traffic and many people coming into the area to walk and watch. This Saturday, August 19th, dance students need to meet at the Rio Salon on 63rd and Bell Road at 9:00 am to line up. It is essential that you be on time – so please plan to arrive early. To help avoid traffic congestion on 63rd St, all participants must enter 63rd St. from Bell Road. 63rd St. from Hwy 9 will be blocked off. Main Street will be closed around 9:30 am and the parade will start at 10:00 am. Our Float theme this year is "Hawaiian Luau ". Dancers, please wear your complimentary Tank Top provided by the studio and anything that would go along with a Luau theme (flowers in their hair, grass skirts, etc)! Be creative. This is a fun chance to show your creative side. Catherine’s Dance Studio will be 4th in the parade line up and will finish walking before the parade is complete. Dancers will march directly to the studio for hot dogs right after. Parents, friends, and neighbors can join the dancers after the parade at the new studio location, 180 English Landing Drive, Suite 140. There will be an open house for dancers and their families to mingle and enjoy each other’s company. Dance families please remember that pink tank tops will not be handed out the day of the parade. In addition, tuition for the 1st quarter must be paid in order to walk in the parade. If you have not paid tuition you will not be able to participate. And lastly, Catherine’s Dance Studio is not responsible for travel from the studio space to the site from which we are starting our walk for the parade. Please be sure to make those arrangements so that you are able to get yourself or your child where you need to be in time for them to walk in the parade. Parents are welcome to walk in the parade but please wear a pink shirt and get creative with a Hawaiian luau theme. 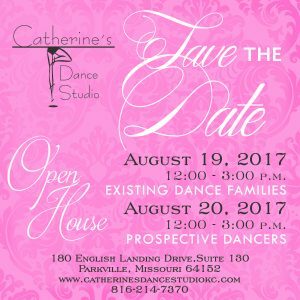 Sunday, August 20, 2017, from 12:00 pm – 3:00 pm, Catherine’s Dance Studio is offering an Open House for any dancers and their families thinking to join the studio family. There will be an opportunity to meet our instructors, view our new beautiful space and discuss your dance goals. All are welcome.